Surrounded by palms and offering views of the Caribbean Sea and Pigeon Island, the Sand Dollar is everything you would picture for a tropical escape. The large pool and sun terrace are perfect for swimming and lounging on hot days, and evenings can be spent enjoying the manicured garden the property features. The home itself is great for small families or two couples, and beaches (great for snorkeling! ), restaurants, and golf are just a short drive away. Relaxing and comfortable, the Sand Dollar has everything you need. Sand Dollar, just recently renovated, is ideally situated in Cap Estate at the northern point of St. Lucia. 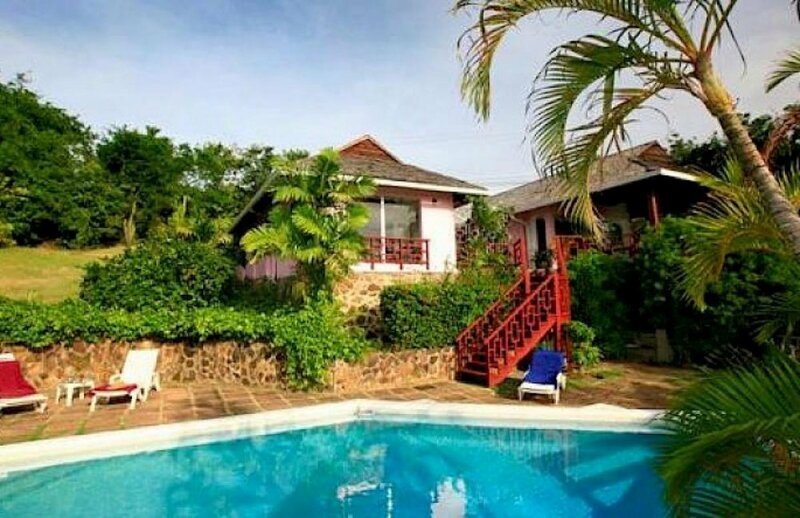 It is on a hillside and overlooking the Caribbean Sea and Pigeon Island. It is only minutes away from beautiful beaches with good snorkeling possibilities, a health and spa center at Le Sport Hotel, as well as an 18-hole golf course. Sand Dollar is sure to make your Caribbean vacation a memorable one. The charming Sand Dollar, set on an acre of secluded, landscaped tropical gardens, has a large living/dining area with ceiling fans and can welcome up to 6, featuring 3 air-conditioned bedrooms (one with a view of the Caribbean Sea), both in a fresh decor with ceiling fans, mosquito nets, and en-suite bathrooms. Through the French doors is a large deck on both the ocean and beach sides of the villa. A courtyard with lush tropical foliage connects the living quarters with the bedrooms. A spacious, shingle-roofed open-air dining patio is ideal for enjoying meals and cocktails at sunset, and the pool is surrounded by a sun terrace. Supermarkets and shops are within easy reach at Rodney Bay. Please note that housekeepers are not trained nannies and should not be expected to look after and/or babysit infants and children. If you do make babysitting arrangements with the staff, please be advised this is at your own risk. Smugglers Cove Beach and Anse Du Cap are closest beaches. Discount of 10% off rental rate. Applies to bookings 3 nights or more.